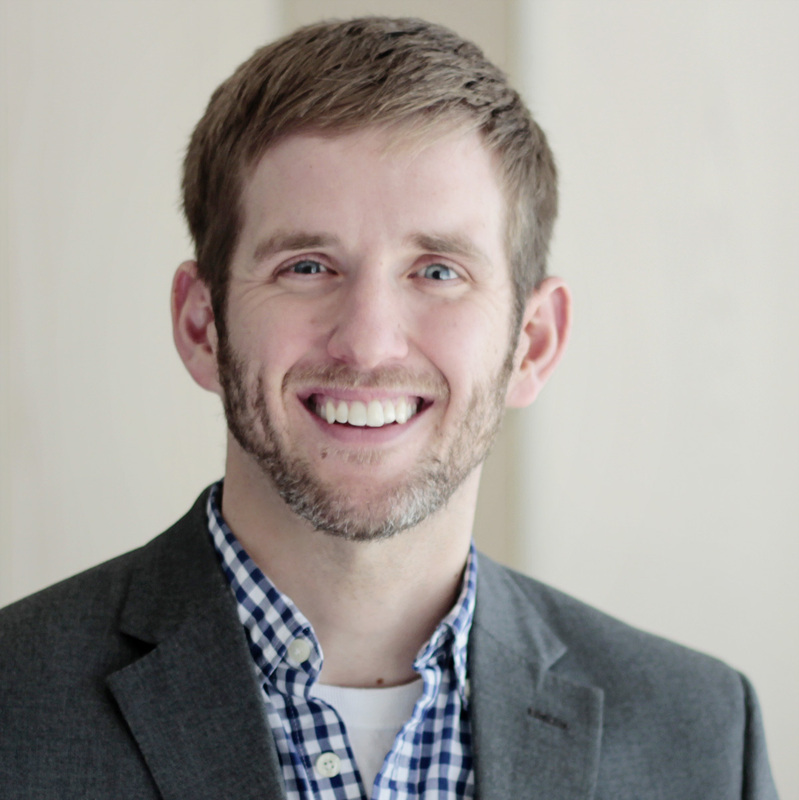 Life insurance has long been a popular employee benefit, providing a safety net to employees’ spouses and dependents should the unthinkable occur. 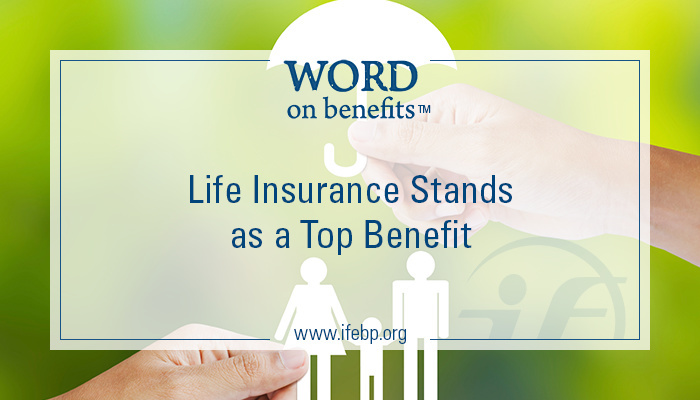 How do your life insurance benefits compare with offerings from other organizations? The International Foundation’s Employee Benefits Survey 2014, the fourth offering in its benefit benchmarking series, included a number of questions related to life insurance benefits. The responses provided insights into organizational life insurance offerings, including prevalence, calculation methods for benefit payout, and specific benefits offered to survivors. 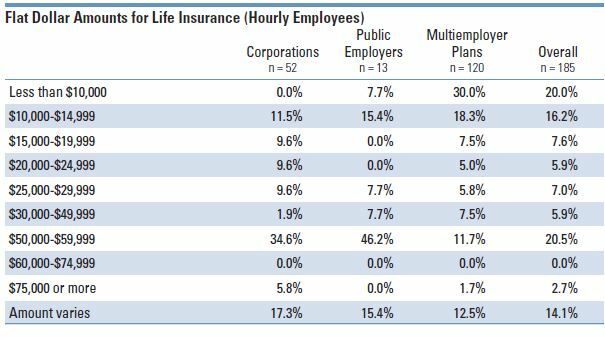 Most employers surveyed (83.8%) offer life insurance benefits to their workers. 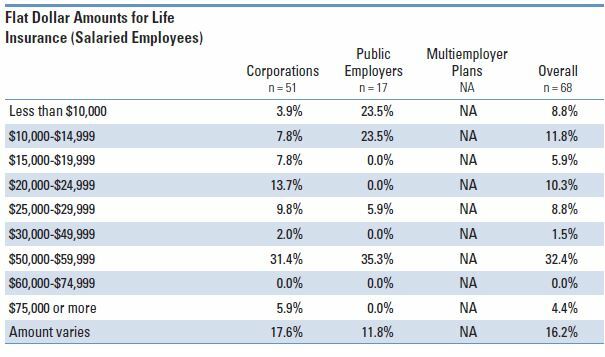 Respondents from corporate (92%) and public employer (90.5%) sectors were more likely than multiemployer funds (71.6%) to offer life insurance benefits to their workers. Organizations can calculate their life insurance payments to beneficiaries through either a flat dollar amount or a multiple of earnings formula. There were substantial differences in preference based on whether organizations are covering salaried or hourly workers. In regard to salaried employees, seven in ten respondents utilize a multiple of earnings (70.7%) formula for their benefit payments. In contrast, 26.6% of responding organizations offer a flat dollar amount to life insurance beneficiaries. When evaluating hourly employees, organizations are more likely to offer a flat dollar payment (54.1%) than a multiple of earnings payment (41.2%) for beneficiaries. When evaluating flat dollar benefit amounts for salaried employees, payments ranged from less than $10,000 (8.8%) to $75,000 or more (4.4%). The average flat dollar payment for salaried employees was $35,702. Respondents reported less generous benefits for hourly employees receiving flat dollar payments. One in five (20%) reported flat dollar amounts of less than $10,000, while only 2.7% pay more than $75,000 or more. The average flat dollar payment for hourly workers was $26,211. In addition to monetary payments, organizations may offer a variety of additional benefits to survivors of employees or retirees. Overall, 65.2% of survey respondents offer survivor benefits to those who pass away while policies are in effect, a practice more common in the public sector (81%) than from corporate respondents (62.5%). 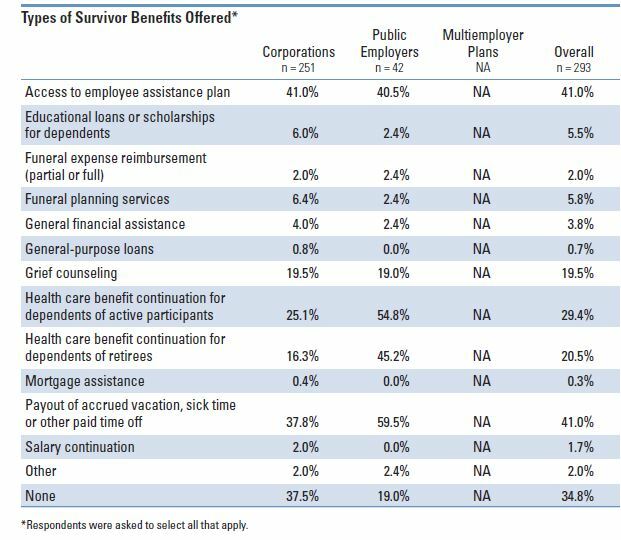 The most commonly offered survivor benefits include access to an employee assistance plan (41%), payouts of accrued vacation, sick time and other paid time off (41%), the continuation of health care benefits for dependents of active participants (29.4%) and retirees (20.5%,) and grief counseling services (19.5%). Funeral planning services (5.8%) and educational loans or scholarships for dependents (5.5%) are also occasionally offered. Find more information in the Employee Benefits Survey 2014. And stay tuned for more special reports from the Employee Benefits Survey here on the Word on Benefits.